Khaltmaa Battulga, the presidential candidate of the opposition Democratic Party waves to reporters after addressing them in Ulaanbaatar, Mongolia (July 8, 2017). Mongolia Just Chose a New President. What Now? Mongolia is set for 3 years of cohabitation between President Battulga and an MPP parliament. On July 7, Mongolians voted in a presidential run-off for the first time since democratic elections began in 1992. 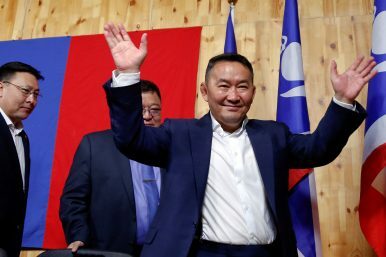 And for the first time since the 1993 presidential election, they handed the former state-socialist ruling party, the Mongolian People’s Party, a result of barely 40 percent in a two-candidate race. The Democratic Party’s candidate, Kh. Battulga, won election with just over 50 percent of the vote and will thus succeed DP leader Ts. Elbegdorj for four years at the helm of the country. But wait, those results add up to just over 91 percent! Yes, Mongolians forcefully voiced their displeasure with the candidates the two large parties had nominated by turning in blank ballots. Nearly 100,000 voters chose this none-of-the-above option, which had been inserted into the election law in 2015. Had 8,000 fewer voters chosen Battulga, the General Election Commission would have had to cancel the election and re-start it with another nomination of candidates, because no candidate would have achieved a majority of votes. Battulga will assume the presidency under a cloud of corruption from multiple past business deals, but especially for his involvement in railroad construction that was financed by the 2012 Chinggis Bond. Repayment of that bond landed Mongolia in a sovereign debt crisis this spring, which had to be addressed through an IMF-led rescue package. But he also assumes the presidency having run a surprisingly disciplined campaign that united the often-divided Democratic Party (DP) behind him and assured many voters that he would provide an important balance to the parliament that is dominated by the Mongolian People’s Party (MPP). His campaign suggests that he has some potential to grow into a more statesman-like role as is expected from a president. Despite his personal reputation, one might even imagine him assuming the high moral ground and leading a genuine fight against corruption, though such a conversion is just a potential development for now. On the other hand, he is also prone to Trump-like populism and chaos, especially in his relationship to China and to foreign investment. But part of his popularity in the run-off stemmed from last-minute MPP efforts to buy the electorate through increased child payments and other shenanigans that endanger the IMF bailout. Battulga might recognize that his voters were not duped by these populist promises and thus check his own populist inclinations. Very little is to be expected from newly-elected President Battulga in coming months. The biggest struggle will be between him and the MPP prime minister and parliament until they settle into some kind of working relationship of cohabitation. That struggle will most likely include attempts at changing the constitution to curtail presidential power. The result of the run-off was a resounding defeat for the MPP and its candidate M. Enkhbold. He was personally repudiated by Ulaanbaatar-based voters who recalled allegations about shady land privatization deals when Enkhbold served as mayor of the capital city. With the poorest showing for an MPP candidate in 25 years, Enkhbold will be removed as chairman of the party. This will lead to an open power struggle between younger cadres who are demanding a reorientation of the MPP toward policy substance, most likely under a broad social-democratic umbrella and the leadership of U. Khurelsukh. They may be opposed by party princelings, often the sons of wealthy business owners, who are likely to preserve the party’s focus on strong organization with a rural base, but no clear ideological definition. Party offices will be contested in this struggle, but given the party’s super-majority in parliament, state offices will also be re-shuffled, including the prime minister and chairman of parliament. Mongolian voters have been frustrated in last year’s parliamentary and this year’s presidential contest. They have been angry with the two large parties and their machinations to stay in power for power’s sake and – often – for financial gain. S. Ganbaatar’s surprisingly strong showing as the third candidate in the first round this summer, as well as the 8 percent of voters who abstained in the run-off, are clear indications of this frustration with current party politics. With the next parliamentary election coming in 2020, Mongolian voters have the opportunity to turn the small abstention movement into either a general political mobilization focused on corruption, for example, or to take this as the impetus for new parties that develop an ideological profile rather than a patronage system. This movement came from nowhere, with only 1.5 percent submitting blank ballots in the first round and little more than a ten-day social media campaign to educate voters that a blank ballot was a legitimate and legal choice. Like some of the excitement about the National Labor Party ahead of the parliamentary election, the 100,000 blank ballots demonstrate the potential for reformist political movements. An on-the-ground look at campaigning and voting in Mongolia's tight presidential race.